Karen Scott of Apsley has spun her way to $400,000. She won the top prize in OLG’s The Big Spin Instant game, a $5 game that combines scrach play with prizes revealed in-store by an animated spinning wheel on the lottery terminal screen. If the animated wheel stops on “Big Spin”, the player wins an in-person spin at the OLG Prize Centre in Toronto, for a guaranteed prize of $100,000 to $500,000. 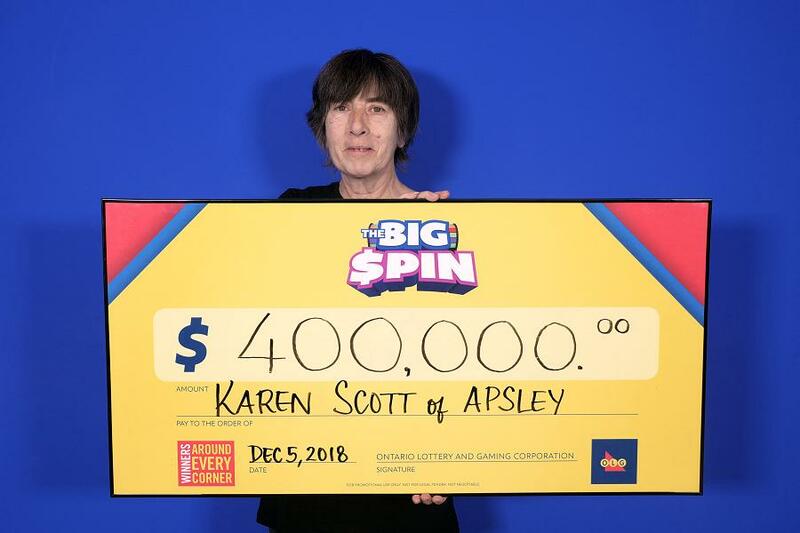 Scott took the spin in Toronto on Wednesday (December 5) and claimed a prize of $400,000. The winning ticket was purchased at Foodland on Elgin Street in Madoc.